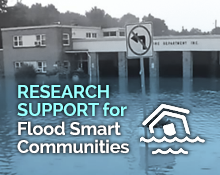 Research support to create “flood smart communities,” or places that are resilient to flooding across New York State. Research support to create “flood smart communities” for the communities of Greece, Parma and Hilton, NY. In partnership with local municipalities, The Nature Conservancy, and the Genesee/Finger Lakes Regional Planning Council, the Regional Institute provided technical support in the development of a “Flood Smart Action Plan,” to make these communities more resilient to flooding, drainage and stormwater issues. Research support for the project included developing a community survey, and synthesizing its findings; undertaking a comprehensive flooding vulnerability assessment that overlaid social, economic and structural vulnerabilities with areas of physical risk; and a cost-benefit analysis to estimate the costs of flooding and potential savings from future mitigation strategies. Research support to create “flood smart communities” along the Cohocton River in Steuben County, NY. In partnership with local municipalities, Steuben County, The Nature Conservancy and the Southern Tier Central Regional Planning & Development Board, the Regional Institute provided technical support for a Flood Smart Action Plan to make communities in the Cohocton River watershed in Steuben County more resilient to flooding. Through collaboration and novel research, the work aims to reduce flooding vulnerability, improve water quality and increase resiliency to flooding to benefit human and ecological communities. The Regional Institute conducted a comprehensive vulnerability assessment that overlaid social, economic and structural vulnerabilities with areas of physical risk. The full plan will be finalized in the spring of 2018. This entry was posted on January 27, 2016 .